Why Does Senator McCaskill Want to Bankrupt Our Children? That is what people should be asking Missouri Sen. Claire McCaskill along with her fellow senators who advocated strict caps on government spending. The idea being pushed by Senator McCaskill, together with Tennessee Sen. Bob Corker and several other prominent senators, would limit federal spending to 20.6 percent of GDP. It would require difficult-to-obtain super majorities to exceed this cap. Spending would be cut across a variety of programs if the cap is not reached. This proposal is hugely deserving of ridicule for a variety of reasons. First, it operates from a blatantly wrong premise – that government spending has grown out of control. Spending has risen in the wake of the downturn, but this was not due to a flood of new and expensive government programs. It was overwhelmingly attributable to the expansion of safety net programs like unemployment compensation and food stamps and a decline in GDP, which raises the spending to GDP ratio even when spending remains constant. If McCaskill and the other senators are upset about this recent rise in spending, then they should be going after the incompetents at the Fed and Treasury who somehow could not recognize the $8 trillion housing bubble, the collapse of which wrecked the economy. This was indeed a horrendous mistake that has been devastating to the country, but it has nothing to do with government spending. Over the long-term, government spending is projected to rise, but this also has nothing to do with the profligacy of Congress. There are two reasons for the projected increases in spending. The first is an aging of the population. As a result, federal programs that provide for the elderly like Social Security, Medicare and Medicaid will cost more money. The second reason is that health care costs are still rising out control. The United States already pays more than twice as much per person for health care as other wealthy countries. This disparity is projected to grow even larger in coming decades. If this proves true, then it will both impose enormous costs on the private sector and lead to growing strains on the budget. By contrast, if health care costs were brought under control, we would be looking at huge budget surpluses in the decades ahead. Of course, controlling costs would mean confronting the insurance and pharmaceutical industries and other powerful lobbies. Unfortunately, Senator McCaskill and her colleagues lack the courage to confront such powerful elites. In fact, McCaskill and her colleagues do not even have the courage to propose cuts for specific programs. 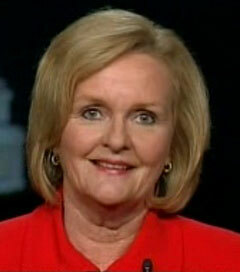 Does McCaskill want to cut Medicare, Social Security, Head Start, unemployment insurance? She won't tell her constituents or the country. She just wants to cut generic spending. This one might sell well with the Wall Street crew, but it is incredibly bad policy. First off, any budget expert can quickly devise 100 ways to game spending caps, the most obvious being tax expenditures, where the government gives a tax break for items it wants to subsidize. This does not count as spending. More importantly, a strict limit on government spending that is binding would prove enormously costly because there are some things that the government does more efficiently than the private sector. Providing Medicare to retirees is one of the items in this category, according to the nonpartisan Congressional Budget Office (CBO). CBO's analysis of Representative Ryan's plan for privatizing Medicare showed that having private insurers take over the Medicare program would add more than $34 trillion to its costs over its 75-year planning period, an amount that is almost seven times the size of the projected Social Security shortfall. CBO's analysis implies that the Ryan plan, which was approved by the Republican House last month, would increase the cost of paying for retirement health care for someone turning 65 in 2022 (the first year the plan takes effect) by almost $170,000. This doesn't count the cost transferred from the government to beneficiaries. This is pure waste associated with using a more inefficient private system rather than the public system. There is a similar story with Social Security. The administrative costs of privatized systems like those in the United Kingdom or Chile are 20-30 times as high as the administrative costs of the Social Security system in the United States. This would cost a typical retiree close to $40,000 in higher fees (which is income to the financial industry) that would come directly out of their retirement income. If Senator McCaskill and her colleagues really expect their caps to be binding, then they must want to privatize either Social Security or Medicare or both. Arithmetic leaves few other options. By 2030, the CBO projects that spending on Social Security, Medicare and Medicaid would take up 14.5 percent of GDP. If we assume, conservatively, interest payments of 3.0 percent of GDP, this brings us to 17.5 percent of GDP against a proposed cap of 20.6 percent. Any reasonable level of spending on the military, education, infrastructure, the environment and research and development would push the country far over the cap. This would leave little choice except to privatize Social Security and/or Medicare, imposing an enormous and unnecessary burden on our children and grandchildren. The higher costs associated with privatized programs will leave all but the wealthiest workers struggling in retirement. Of course, the senators who want to impose this enormous burden on our children and grandchildren will mostly be enjoying a comfortable retirement themselves by the time the effects of their policy are being felt. In the meantime, they will have enjoyed the praise of the Wall Street crew and the elite media for having the courage to destroy the programs that the middle class depends upon. Welcome to Washington.